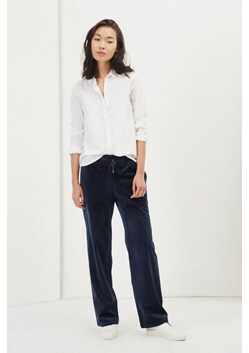 Loungewear goes luxe this season with this plush pair of navy velvet joggers. They are fitted with a drawstring, elasticated waistband for comfort, side-seam pockets to store essentials and relaxed, wide legs for effortless ease. Wear into the weekend with a tucked-in tee and trainers.